Davidson was a late graduate to cars having waited until the age of 21 to make his Formula Ford debut. He carried the Mygale fight to the dominant Van Diemens and did enough during the course of the year - on his way to third in the standings - to prove his ability for a place in the Young Driver final. It is always a nail-biting wait for the six finalists of the McLaren Autosport BRDC Young Driver Award, but one that is worth the shattered nerves for the eventual victor. The chance to join a unique list of British talent, including Formula One stars David Coulthard and Jenson Button and Champ Car ace Dario Franchitti, and to be highlighted as one of the future stars of the sport is prize enough. Add in a McLaren F1 test, a £50,000 cheque and BRDC membership as well, and it takes some beating. Anthony Davidson, the 12th driver to join that elite list, is more than used to handling pressure, though. Throughout a tough rookie year in Formula Ford Zetec, the 21-year-old held his nerve to take third place in the standings, then victory in the end-of-season FFord Festival. His pace was enough to secure one of the six places in the Young Driver award shoot-out, where he impressed the judges considerably with both his speed and attitude. As ever, it was a tough call, but there can only ever be one winner and Davidson was a fitting victor. "This is the biggest thing that I've ever won," he admitted as he struggled back to his table after the obligatory photoshoot. "I felt after the test that I had done enough to win, but I kept saying, 'How can I be so confident?' It's like winning, though - when you're confident, you usually come off best." It is no surprise that Davidson's name is already being mentioned in connection with an F1 test deal, as his career has almost mirrored that of Williams F1 ace and '98 Young Driver winner Jenson Button. Throughout his time in British and European karting, Davidson, along with rival Brit Button, was always tipped as one-to-watch. A string of national titles in the early '90s was followed by a move to Europe for 1996 and runner-up spot in the International Formula A series to Italian Giorgio Pantano. Button, after a tough year, was left back in fifth place in the standings. While Button quickly moved up to single-seaters, though, Davidson opted to stay in karting until '99 to gain more experience. 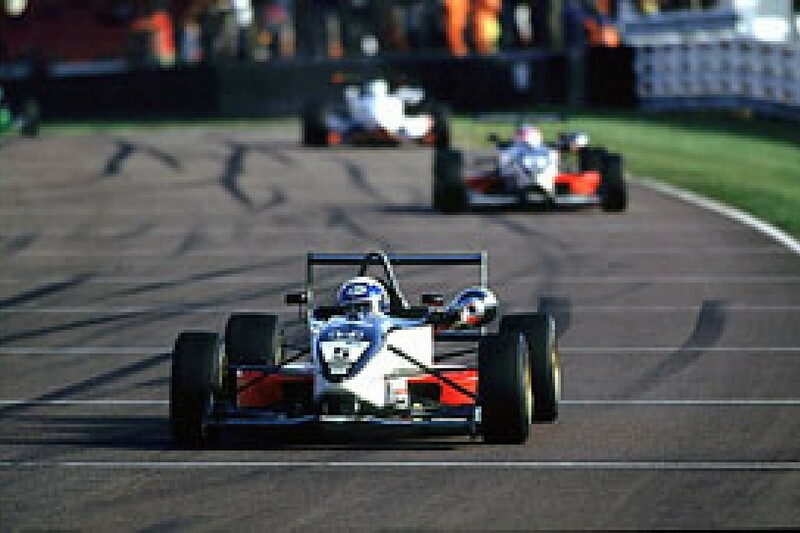 After a string of superb late-season wins in Kent County FFord in '99, Davidson went on to take the FFord Zetec Winter Series title with works Mygale outfit Haywood Racing - the same team in which Button won the FFord title and Festival in '98 - before joining it full-time for 2000. It has been a tough first season for Davidson, though, as the works Van Diemen team dominated, leaving him to develop an all-new Mygale chassis under intense pressure. A few mistakes were made along the way, particularly in the early races, but Davidson's speed was clear to see. "I never realised how tough it would be," he admits. "It sort of pounced up on me. I just thought, 'I'll get the testing, the car's quick and Haywood have won two titles in a row'. But, bang, there was Van Diemen in a prime year again. I had to work hard and can see now from the outside what I went through. "If someone had told me what I had to do, then I would have been a lot more nervous and less anxious to win first time out. Maybe naivety is a good thing when you first start out because you just come in, give it your best and don't care how good the car is - you just give it 100 per cent." Davidson has got used to being in the shadow of other people this year as his brother, Andy, starred in Channel 4's Big Brother, but the comparisons with Button are always in the background. "I do feel that I'm following in his footsteps," Davidson acknowledges. "I think he knows that as well, and is happy because we've known each other on and off the track for years. He was lucky enough to get the break with a good manager - which is what you need and I've realised as I have gone up the ladder. I can learn from him." On the flipside of the coin, Button is equally aware of Davidson's progress and future potential. "We've had some great races in karting through the years," he says. "He's done a lot of good work this year, but there's a lot to come still. The next couple of years are important, but, if he gets it right, there's a good chance of him getting to F1 as well as myself." Davidson was not the first nor the last McLaren Autosport BRDC Award winner to take his prize money to Trevor Carlin the following year. He was pitted against future Super Aguri teammate Takuma Sato for his first Formula 3 campaign. Davidson was perhaps unfortunate in that as the more experience Japanese driver took a clean sweep, winning the British title (with 12 wins), the Masters and the Macau Grand Prix. But his was still a credible effort, particularly for a rookie, with six victories and the runner-up spot in the championship. He was eager to jump straight from F3 to F1, as Button had done previously and Sato was about to do, but there was no seat available and all of a sudden there was no full-time campaign for Davidson from 2002 onwards - after just two seasons of car racing. Instead, he spent the autumn and winter of 2001/2 pounding round Europe helping BAR Honda to develop their car. His F1 debut still came in 2002, but it was just two outings in place of Alex Yoong at Minardi at the Hungaroring and Spa-Francorchamps and he spun out of both races. But the disappointment only increased his determination to get another chance and prove his ability. He returned to testing duties for BAR in 2003 and 2004 while Sato occupied the second race seat. Davidson got his second chance at Malaysia in 2005, with BAR, but his race was to last only two laps before the Honda engine gave up. But his loyalty to Honda paid off, and eventually having earned something of a super-sub reputation, the Japanese giant granted him a crack at a full season's racing with Super Aguri, some six years after his year in F3, and once again Sato was to be his teammate. It was always going to be difficult to make an impression with Super Aguri, though Davidson was close to threatening the top ten on a number of occasions. He ran Sato close, but once more it was the Japanese driver who got the attention thanks to his sixth place finish at Montreal - a race where Davidson could have finished on the podium had he not hit a resident rodent at the hairpin. It already seems like so long ago that Super Aguri pulled out of Formula One, leaving Davidson without a drive again, and the car was too far off the pace for him to make much of an impression in the first four races of 2008. So he's back to square one. He looks unlikely to land a race seat in F1 again next season and with his 30th birthday approaching in the spring, his window of opportunity could be closing. Davidson has so far resisted a move across the pond to IndyCar, where his Honda links and F1 pedigree would no doubt help him on his way. But his determination to make it in F1 has come at the expense of a potentially successful career racing anything else. At least it has so far.